There’s some shipping magic in the Magic City. Beset by road congestion, a rail bridge shuttered by storm damage and a harbor too shallow for many big container ships, the Port of Miami has operated largely under the radar for most container carriers over the last five years. 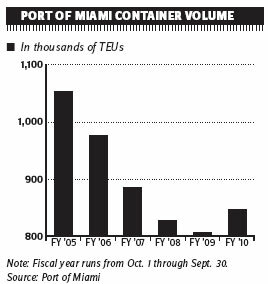 Miami’s container throughput has declined some 20 percent decline since the port achieved record volume of more than a million TEUs in 2005. Much of that drop occurred after Mediterranean Shipping Co. shifted some 200 vessel calls a year to Port Everglades at the end of 2005, and volume has been sliding since. But the East Coast’s sixth-largest container port hopes to recapture that lost volume and possibly a more by repositioning itself as a gateway for a much larger share of Florida’s containerized imports, most of which currently move by landbridge from the West Coast or by truck from Savannah. To get there, Miami is engaging in a three-pronged attack: deepening its shipping channel to 50 feet; constructing a controversial four-lane tunnel from the port, allowing trucks to connect directly to interstate system without passing through downtown Miami; and repairing the railroad bridge and building an inland rail terminal and distribution center in Hialeah, about 10 miles north, that will connect with Florida East Coast Railway’s main trunk line to the north. Those are ambitious targets for a port that handled 848,000 TEUs of imports, exports and empties in the year ending Sept. 30. When the projects are completed, Miami will join Norfolk, New York-New Jersey and Baltimore as the only East Coast ports with 50-foot channels. As the closest East Coast port to the Panama Canal, Miami could become the first call for larger ships transiting the canal’s new locks after 2014, because those ships will need to lighten their loads enough to be able to enter other South Atlantic ports farther up the coast. Miami got a leg up on its repositioning strategy in late October when it received a $22 million U.S. Department of Transportation TIGER II grant to restore and upgrade rail service between the port and the Florida East Coast Rail Yard in Hialeah (related story, page 25). The grant will help the port fund part of the $46 million cost of bringing two to four 3,000-foot parallel tracks near the three container terminals in Biscayne Bay. The port’s three container terminals are POMTOC, whose majority owner is Ports America; Seaboard Marine; and South Florida Container Terminals, a joint venture between APM Terminals and CMA CGM. At the other end, the rail tracks will provide direct access to a new 300-acre intermodal yard at the northern edge of Miami airport, 12 miles from the port. “It will give us a straight shot into the Jacksonville and Atlanta market, but is also creating the first part of an inland port for us,” said Kevin Lynskey, the port’s assistant director for business development. He said the TIGER grant would enable the port to complete the rail project by 2012. Above-ground construction work started in June on the $914 million project to dig a tunnel that measures three-quarters of a mile from the island in Biscayne Bay on which the port is located under the main cruise channel to the interstate highway system. Excavation of the tunnel will begin next August when a boring machine is delivered from Germany. The tunnel is scheduled for completion in 2014. The biggest port project, of course, is the harbor deepening, which Congress authorized in 2006 and has completed its environmental reviews. The U.S. Army Corps of Engineers is conducting the planning, engineering and design for the project. The state and port will likely share $100 million to $120 million of the $180 million cost, with the federal share accounting for $75 million.